Undefeated WBA bantamweight champion Ryan Burnett 19-0 (9) put on a boxing masterclass to retain his world title by 12-round unanimous decision against Yonfrez Parejo 21-3-1 (10) despite breaking his right hand in the early rounds at Principality Stadium in Cardiff, Wales on Saturday night. The 25-year-old from Belfast required an x-ray on his hand at the nearby University of Wales Hospital after the fight and also has a cut on the ridge of his nose, courtesy of an accidental headclash, tended to. Burnett said the hand bothered him throughout the bout and he had to use it sparingly in the later rounds. “Any time I let my hands go and my right touched him, I got a sharp pain. I had to rely on my boxing to get through the rounds and win them with my jab,” he said. Burnett never let the 31-year-old Venezuelan into the fight, boxing circles around the challenger to retain his title by scores of 120-108, 120-108 and 116-112. The Eddie Hearn-promoted Burnett now faces a short layoff while his right hand heals, but when he returns there will be plenty of offers on the table. 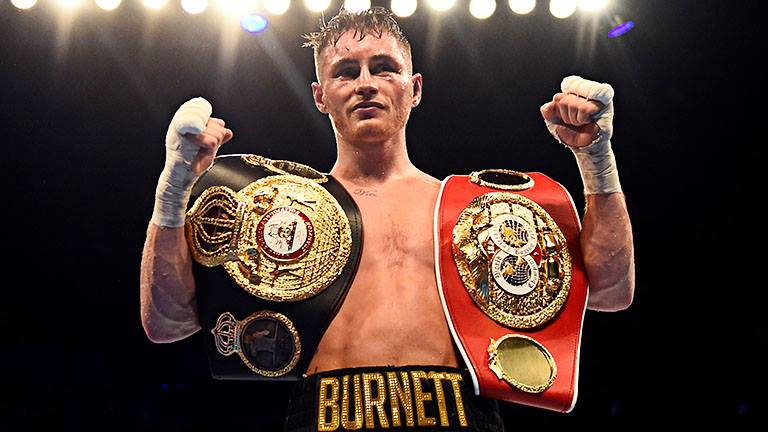 There is already talk of Burnett being offered a berth in the second-season of the World Boxing Super Series, which is expected to feature the best of the bantamweight division. There is also the opportunity to defend his WBA title against the winner of the May showdown between WBO super flyweight champion Naoya Inoue and Jamie McDonnell scheduled to take place in Japan.